The increased activities of the local authority necessitated a proper headquarters for the Burgher Councillors and the Burgher Watch. Consequently a vacant erf facing Greenmarket Square was acquired early in the eighteenth century and the first Burgher Watch House was built on this site in about 1716. 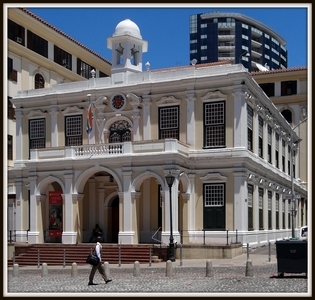 It was designed in the style of an ordinary burgher’s dwelling, but, in view of the rapid expansion of Cape Town under the benevolent administration of Ryk Tulbagh, it was replaced by the present building. The foundation stone was laid on 18th November 1755. The old Wachthuis was demolished in 1755, and on the 18th of November of that year the foundation stone of the new Town and Watch House was laid by Barendt Artoijs, a member of the High Court of Justice. The silver trowel he used on that occasion, engraved with his coat-of-arms and an inscription, is preserved in the City Hall?. Part of the building was occupied in August 1756, and the remainder was completed in 1761. It housed the Burgher Council as well as being the headquarters of the Burgher Watch, and, later, meetings of the Burgher Senate were held there. Situated on the corner of present-day Burg and Longmarket Streets, and known as the Old Town House, it was restored and renovated in 1916 to house the famous Michaelis Collection of seventeenth century Dutch masters.